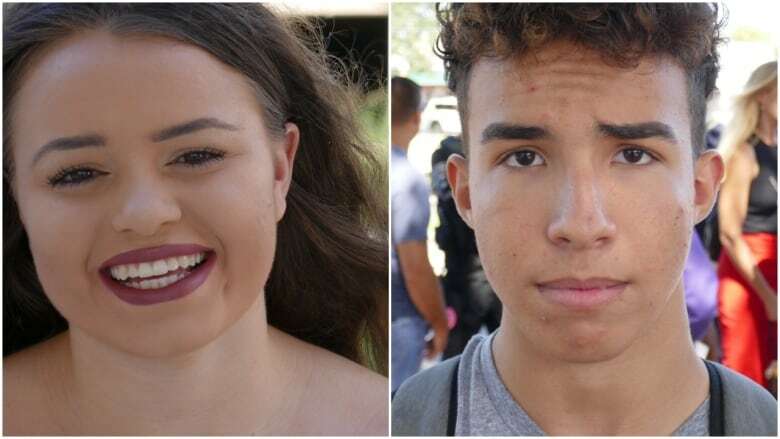 Survivors of the Parkland school shooting started a political movement in the U.S. to increase youth voter participation. It's unclear how successful they will be. On a recent Saturday morning, Parkland school shooting survivor David Hogg wandered the dormitory halls at Florida International University, knocking on doors. Ahead of Tuesday's U.S. midterm elections, he had a simple message for the sleepy students who answered: get out and vote. The 18-year-old survived the Valentine's Day mass shooting at a Parkland, Fla., high school, which killed 17 students and staff members after a former student opened fire. "People act like you're just supposed to move on from this. No, you can't move on from something that never should have happened," Hogg told CBC Radio's The Current. Following the massacre, he went on to co-found the #NeverAgain movement, which led massive March for Our Lives youth protests to press for gun control. 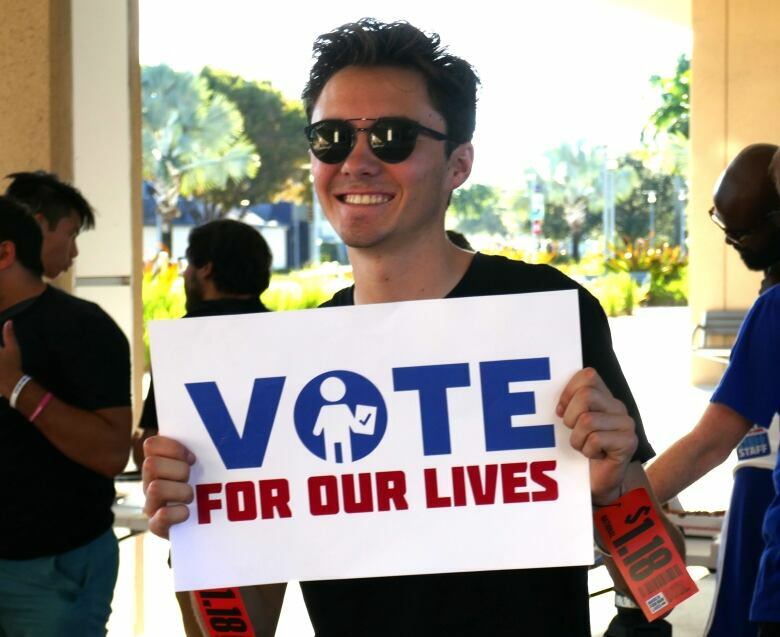 Since June, survivors of the Florida school shooting have embarked on the Vote for Our Lives tour, making over 100 stops in 25 states. The tour aims to get young people registered to vote and "elect morally just leaders who will help us end gun violence in the U.S.," according to its website. "For some people it took them to see their best friend in a casket before they started voting. It shouldn't take that," Hogg said. "Whatever our generation wants can easily happen within the next 10 years, if we just vote." It's unclear, however, whether the movement will have any discernable impact on youth voting. An online poll conducted in early October by the Institute of Politics at Harvard's Kennedy School of Government suggested 18 to 29-year-olds are "significantly more likely" to vote in the upcoming midterm elections compared to 2010 and 2014. Forty per cent of the 2,003 survey respondents said they will "definitely vote" Tuesday. Meanwhile in 2014, 19.9 per cent of voters aged 18 to 29 cast a ballot in the midterm elections, according to the Center for Information and Research on Civic Learning and Engagement, which characterized it as the "lowest rate of youth turnout recorded in the in the past 40 years." 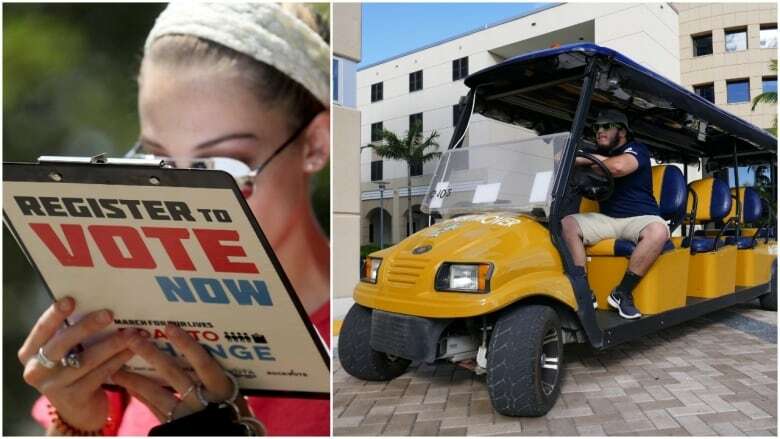 "Young people have to have that issue; that candidate that really drives them out to vote," said Kathryn DePalo, a university instructor at FIU's department of politics and international relations. "Certainly, I think this election qualifies." In the lead-up to the vote, Parkland students "have kept the gun control issue first and foremost in voters' minds," particularly in South Florida, DePalo said. However, public support for gun control — specifically for a ban on assault rifles — has waned since the school shooting, polling data suggests. In March, Florida Gov. Rick Scott signed gun-safety measures into law, which raised the minimum age to buy rifles from 18 to 21, imposed a waiting period on gun purchases and allowed some school personnel to be armed. The National Rifle Association, a pro-gun lobby group, filed a federal lawsuit, arguing that the measures violate the Second Amendment. That action is ongoing. Hunter Pollack, whose 18-year-old sister was killed in the Parkland shooting, worked to get the measures passed, but he doesn't think the #NeverAgain campaign deserves any credit. "They weren't in Tallahassee with us when we got the bill passed," said the 21-year-old political science student, who spoke to The Current at a rally for Republican candidate Ron DeSantis. After the Parkland shooting, Pollack became an advocate for increased safety measures in schools rather than the gun control called for by #NeverAgain. "We need metal detectors, limited entry points, armed guards," he said. "We need more spending on mental health and we need good manpower — we need to teach our security guards, to teach our teachers, properly what to do in an active shooter situation." The #NeverAgain movement is a distraction from achieving those goals, he said. "I actually despise what they're doing," he added. "They're in this for followers and fame and possibly money in the future. So I don't respect them and I won't respect them moving forward." Pollack's mother, Julie Pollack, said that gun control is a polarizing issue, but people "should all be angry." "It's unfair that after 20 years — with a lot of violence in the schools — that we're not more careful with safety and security," she said. "I just hope people listen to each other because I think, in the end, we're asking for the same thing. So I'd rather work together than against other people." Gabriela Cabrera, who's studying public relations, advertising and applied communications at FIU, said she sees more political engagement among her peers through social media. "Young people are seeing that their one vote can change the whole entire government." The Current spoke to Cabrera at an early-voting event on the Vote for Our Lives tour in FIU, but not all of the young voters motivated by the Parkland shooting support the #NeverAgain movement. "Many young people like myself don't like the way that the March for Our Lives kids have represented the community," said Christian Rowell, a 16-year-old student at Atlantic Technical College in Coconut Creek, Fla.
Rowell has been helping the Pollock campaign for Ron DeSantis, and spoke to The Current at a rally for the Republican candidate. He praised the Vote for Our Lives' drive to register young voters, but rejected their ideas on gun control and worried about the candidates they supported. "We feel like the March for our Lives kids just don't really elaborate on the candidates, and they don't really shed light on what they're going to do and the cons of these politicians they want to vote in." Cameron Kasky, a founding member of #NeverAgain, grew "weary" of these deep divisions over politics and strategy. He left the group over the summer. "I started looking around and I started seeing what people were calling each other and I said, 'This is ridiculous. I can't take part in this anymore.'" Kasky and his father, Jeff Kasky, spoke with The Current in a crowded restaurant in Boca Raton, Fla., where several well-wishers came up to thank the 17-year-old for his activism. When one woman told Kasky she followed him on Twitter, he joked; "I'm so sorry." While still an advocate for gun control, his viewpoint has shifted in the months since he survived the Parkland shooting. "I used to think if you disagreed with me, you're a bad person, if you disagree with me on guns, you don't care when kids die," he said. 'We don't see the reality of what bullets do to bodies': Should images of school shootings be public? But after meeting gun owners, he realized they were not "people who shrug off school shootings," but people with different ideas on how to prevent them. "We all need to realize that everybody in this country wants pretty similar things, including safety and prosperity for everybody in it. "You can buy into any narrative you want — that folks who don't believe in gun control are evil bloody hacks — but that's just garbage." For comparison purposes only, a probability sample of the same size for the Institute of Politics' online poll on youth voter intentions would yield a margin of error of 3.18 percentage points, 19 times out of 20. Written by Padraig Moran. The Current's coverage in Florida was produced by Julie Crysler.